1. I hereby represent and warrant that I am the lawful owner of the Red Skelton artwork, and that I have complete authority to enter into this Listing Agreement in an effort to sell my art. I further represent that the title to said artwork is free and clear of all liens and encumbrances, and that I have the authority to pass free and clear title of said artwork to the buyer. 2. Art Corporation of America agrees to list Seller's art for a period of up to one year from the date that this contract is entered into. The Seller agrees to pay Art Corporation of America the sum of $75 per year for each work of art listed for sale. 3. Art Corporation of America's responsibility to the Seller is limited to the listing of Seller's artwork described on page 1 of the listing agreement. The $75 administrative fee will provide Sellers with the opportunity to list their art for sale on Red Skelton's official website, RedSkelton.com. We will provide, on the website, directly under the photograph of the artwork you wish to sell, whatever contact information you wish to have given to prospective buyers. 4. The Seller will be responsible for the actual sale of the artwork, including collecting the monies due upon sale, and the packing, shipping and insuring of the artwork to the buyer. The Seller agrees to assume all responsibility in negotiating the terms of sale with the prospective buyer and understands that Art Corporation of America shall have no responsibility beyond connecting the Seller with the prospective Buyer. 5. Art Corporation of America's responsibility to the Seller shall be limited to posting a description of your artwork, and a single photograph of each item, on its internet site. All information posted on the internet shall be provided by the Seller, for which Seller assumes complete and total responsibility for its accuracy. The Seller shall be responsible for reviewing their listing and notifying Art Corporation of America if there are errors in that listing. 6. The Seller shall provide Art Corporation of America with the Seller's preferred method of buyer contact: email and/or telephone. 7. Art Corporation of America does not represent, warrant, or guarantee that the listed art will be sold through its website. 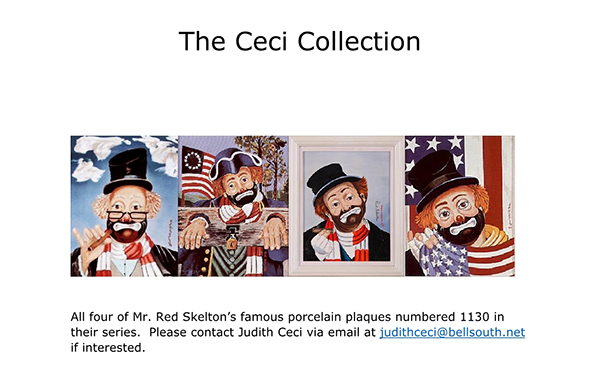 Art Corporation of America's sole responsibility will be to provide Seller with an internet art forum alerting potential buyers to the availability of your Red Skelton artwork for purchase. 8. Art Corporation of America shall not represent or warrant the authenticity of the artwork listed on the internet site unless the Seller has previously retained Art Corporation of America to provide Certificates of Authenticity & Opinions of Value for the artwork. Similarly, the Seller shall be solely responsible for determining the price of the artwork that they would like to have appear on the internet. 9. Upon request, and for an additional professional fee, Art Corporation of America will issue an official Certificate of Authenticity and an Opinion of Value to the Seller. 10. The Seller understands that the Seller alone is responsible for all representations and warranties concerning the listed artwork, including, but not limited to, the authenticity, value, and condition of the artwork being offered for sale. Seller agrees to hold Art Corporation of America harmless in all transactions between the Seller and Buyer. 11. During the period of this Listing Agreement, Sellers may also wish to privately offer their fine art for sale through friends, placement of ads, or other websites. Sellers are to notify Art Corporation of America, at any time, if they wish to remove a listed work of art from its website, but Sellers understand that the listing fee is not refundable.